Hurricane Sandy may slam into U.S. East Coast as Halloween week "Frankenstorm"
WASHINGTON An unusual nasty mix of a hurricane and a winter storm that forecasters are now calling "Frankenstorm" is likely to blast most of the East Coast next week, focusing the worst of its weather mayhem around New York City and New Jersey. U.S. government forecasters on Thursday upped the odds of a major weather mess, now saying there's a 90 percent chance that the East will get steady gale-force winds, heavy rain, flooding and maybe snow starting Sunday and stretching past Halloween on Wednesday. The storm is a mix of Hurricane Sandy, now in the Caribbean as a Category 2 storm, as well as an early winter storm in the West and a blast of arctic air from the North. They're predicted to collide and park over the country's most populous coastal corridor and reach as far inland as Ohio. Hurricane Sandy lashed the central Bahamas on Thursday night with violent winds and torrential rains, after raging through the Caribbean where it caused at least 21 deaths and forced postponement of a hearing at the Guantanamo naval base on Cuba. "It will get broader. 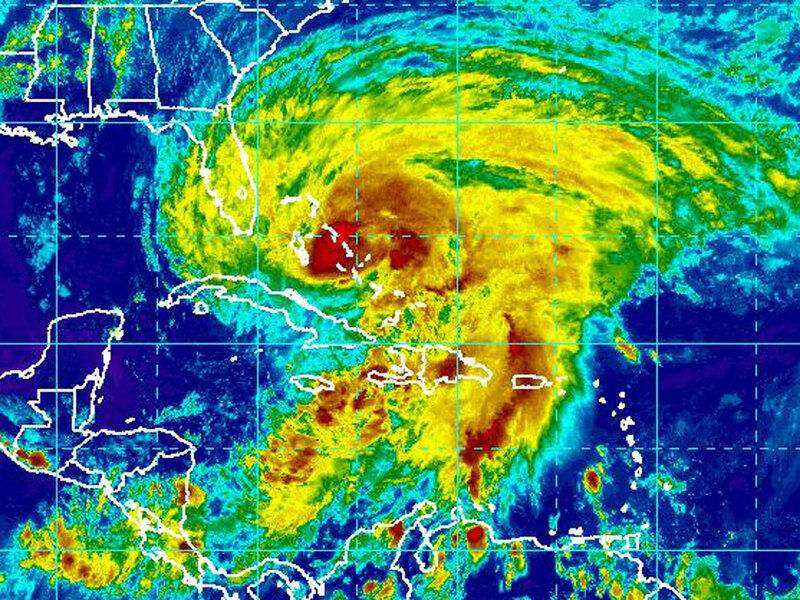 It won't be as intense, but its effects will be spread over a very large area," the hurricane center's chief hurricane specialist, James Franklin, said Thursday. One of the more messy aspects of the expected storm is that it just won't leave. The worst of it should peak early Tuesday, but it will stretch into midweek, forecasters say. Weather may start clearing in the mid-Atlantic Nov. 1 and Nov. 2 in the Northeast, Cisco said. "It's almost a weeklong, five-day, six-day event," Cisco said Thursday from NOAA's northern storm forecast center in near Washington. "It's going to be a widespread serious storm." President Barack Obama has been briefed on the hurricane and the White House is urging people in the storm's path to listen to local officials and monitor weather reports. Spokesman Jay Carney says federal emergency management officials have been working with local officials to prepare. With every hour, meteorologists are getting more confident that this storm is going to be bad and they're able to focus their forecasts more. The New York area could see around 5 inches of rain during the storm, while there could be snow southwest of where it comes inland, Cisco said. Both private and federal meteorologists are calling this a storm that will likely go down in the history books. It is likely to hit during a full moon when tides are near their highest, increasing coastal flooding potential, NOAA forecasts warn. And with some trees still leafy and the potential for snow, power outages could last to the Nov. 6 Election Day, some meteorologists fear.